A classic solution to complex systems is to “open the loop” and study separate components in isolation. Such techniques, for example, were used to study the properties of a deafferented muscle by stimulating the muscle artificially to mimic motor commands. Open-loop techniques have also proven effective in behaviors such as eye movements. Why not apply such techniques to postural control? Because the bipedal body (i.e., the plant) is inherently unstable. If sensory information is removed, the behavior disappears, that is, standing upright is no longer possible. In fact, even partial loss of sensory information is devastating to upright stance, as evidenced by the rare case of proprioceptive loss from the neck down. Without extensive rehabilitation over many years, individuals with such loss are unable to walk without assistance and just standing quietly is barely achievable. Additional sensory loss (e.g., eyes closed) makes standing upright impossible. Thus, biological systems in which the “plant” is unstable require a different approach. We have developed a method called the joint input-output method (JIOM) (to “open the loop” for human standing, which we briefly illustrate below. 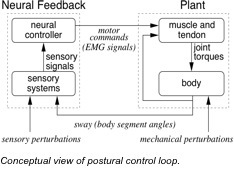 The figure below shows our conceptual view in which the postural control loop is separated into two components: plant and feedback. The kinematics of the body in the sagittal plane is described by body segment angles (e.g., leg and trunk). Muscular activation (e.g., ankle and hip EMG signals) is the input to the plant, with body sway as output. Thus, the plant is operationally defined as the process that maps EMG signals (as a function of time) to body segment angles (as a function of time). Body sway is considered input to feedback with EMG as output. Thus, neural feedback is defined as the process that maps body segment angles to EMG signals. These mappings are described by frequency response functions (FRFs), which describe the linear input-output relation of a process (gain & phase response of output/input). Models of postural control are based on assumptions and inferences about these FRFs (e.g., muscle dynamics, body dynamics, sensory dynamics and time delays.) Based on these assumptions, the models make predictions about different processes within the control loop, such as state estimation and the control strategy. Ideally, to test the assumptions and predictions of a model, one would like to identify each FRF inside the feedback loop. It is currently not feasible to separately identify all processes (FRFs) within the control loop, but we can systematically identify certain combinations of FRFs, leading to important insights about postural control. For a more complete explanation, see the publications below. Kiemel T, Zhang YF, Jeka JJ (2011) Identification of neural feedback for upright stance in humans: stabilization rather than sway minimization. Journal of Neuroscience, 31(42):15144-15153.